It’s very easy to sit down and write up the many reasons why companies could benefit by using commercial cards. For starters, corporate cards provide companies increased visibility and control over their spend. By capturing all payments on cards, corporates have greater visibility over where costs are incurred and with which suppliers, allowing them to control spend, streamline suppliers and negotiate better terms. Cards help manage working capital through extending payment terms. They can liberate staff to manage their personal finance by removing the stress of recouping costs through a long and admin-heavy expenses system. And they have the potential to control fraud through ever-improving reporting mechanisms. But the proof is truly in eating the pudding. Potential commercial card customers will no doubt prefer to join the ranks of a tried and tested service. This, however, presents card providers with a Catch-22: customers will be convinced to join if others do, but a significant swathe of customers is needed to begin with. Fortunately for card providers, there is a wealth of evidence to suggest that corporate card adoption is a formidable trend. As a result, it’s not just the banking clients that are expecting to use cards but also their suppliers, especially as ‘card-only’ transactions in the B2B space become more commonplace. Our most recent white paper, ‘Regional banks: transformation and growth’ reports an average 10% year on year commercial card growth in the US alone. Whereas commercial card spend accounted for a hefty $340bn in 2013, fast forward a few years to 2017 to see it sitting at $487bn – comfortably. Furthermore, our research suggests that this trend is only expected to increase in the coming years; as none of the surveyed banks reported a decline in their commercial cards portfolio, by any metric. Nearly three-quarters of firms surveyed by the AFP Payments Fraud and Control Survey found that the most widely used B2B cards in the US are purchasing cards (73%), followed by travel and entertainment cards (46%). While virtual cards are still not as widely used, they are quickly gathering pace in the US market. The Wall Street Journal added that several companies had experienced ‘both financial and convenience benefits to commercial card programmes’. Offering cards to a larger number of employees (LA-based BlackLine offers cards to nearly half of its 650 employees) drove economies of scale for the card issuer and so, in turn, the client got better terms. Convenience cannot be underestimated as a driver of commercial card use. Being able to reduce time spent queuing means that users – particularly those in time-pressured industries – can pay and go in a matter of seconds. 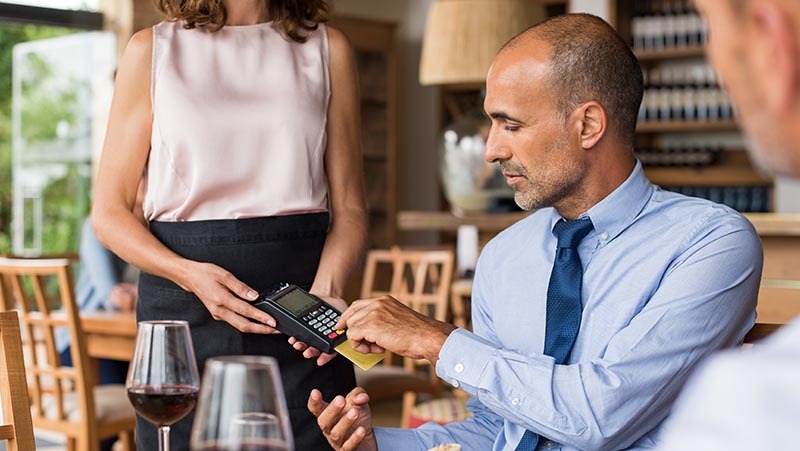 Contactless has been at the forefront of this, as has vending machine technology, stretching into hotel fulfillment and service station ‘pay at pump’ facilities. Soon, users won’t even need to show physical plastic. In the UK, Barclaycard ran an internal trial in 2017 on an invisible payments service that allows customers to take what they want from a shop and just leave, with the app automatically handling the payment. For sectors where employees need to stock up on consumables – the building trade for example – speeding up the checkout process can free up as much as an hour per worker to spend on site rather than at the merchant’s. Strategic Treasurer’s 2017 survey on B2B payments found that 55% of companies made more than half of their B2B payments electronically, while the same number said mobile banking applications were either ‘important’ or ‘very important’. Old style ‘analogue’ payments, meanwhile, are falling out of fashion. In a drive towards automation, cash is no longer king, and cheques are old hat too. 54% of executives say the latter is their least preferred method of payment. It is abundantly clear that using commercial cards is becoming a fundamental part of everyday business life. To not offer them to employees with a purchasing need or remit will very shortly be seen as putting roadblocks in their way. And with payments moving increasingly online, the convenience of that long number as a payments identifier and protector cannot be overestimated.